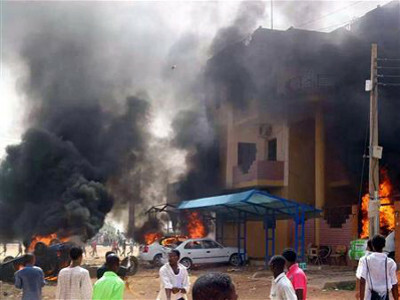 Sudan’s defence minister said young people caught up in recent turmoil had “reasonable ambition”, the second apparently conciliatory gesture in three days from a senior government figure. Students, activists and other protesters frustrated with economic hardships held almost daily demonstrations across Sudan since December 19, mounting a sustained challenge to President Omar al-Bashir’s three decades in power. Defence Minister Awad Mohamed Ahmed Ibn Auf did not directly address protesters’ concerns, but said the situation in the country showed a schism between young and old. That, he added, “requires inter-generational communication and fair solutions to youth problems and realising their reasonable ambition”. Recent events “showed the need to reshape political entities, parties and armed movements with a different mindset than before,” he said during a briefing with military officers, according to a ministry statement. Police dispersed dozens of protesters in the Shambat neighbourhood of Khartoum on Monday and dozens more across the Nile in Omdurman, witnesses said. People have taken to the streets across Sudan, frustrated with price hikes and shortages in cash, bread, petrol and other essentials, calling for Bashir to go. Many echoed slogans used in the Muslim world’s “Arab Spring” uprisings. Rights groups say at least 45 people were killed during clashes with security services, while government puts the death toll at 30, including two security personnel. Bashir shows no sign of conceding any power and blames the protests on foreign agents, challenging rivals to seek power through the ballot box. Prime Minister Moataz Moussa on Saturday appeared to soften the official stance on the protests, describing demonstrators’ calls for better living conditions as “legitimate”.